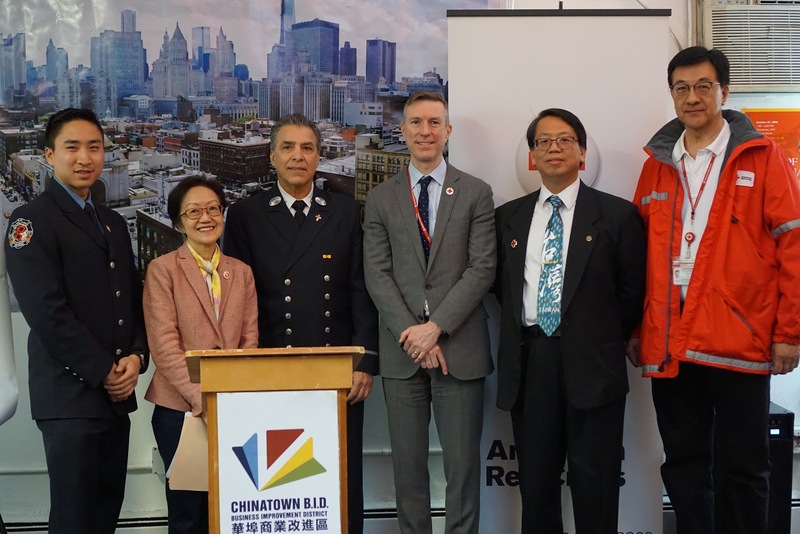 Council Member Margaret Chin standing with Red Cross Greater New York CEO Josh Lockwood in a press conference to promote the 2019 Sound the Alarm campaign. Over the last 7 days, the Greater New York Red Cross provided emergency assistance to 223 adults and 54 children following 57 local disasters. Here are some highlights from last week and a preview of upcoming activities (see below). On Sunday, News 12 reported on a 2-alarm fire in Mott Haven, Bronx which displaced more than a dozen residents. Red Cross assisted 15 people. On Friday, ABC7 reported on a 3-alarm fire that tore through several storefronts and damaged a few apartments in Queens. The Red Cross assisted the displaced residents. Thursday morning, Council Member Margaret Chin joined the Red Cross for a press conference in advance of our big May 1, 2019 Sound the Alarm campaign kickoff! Check out some photos of the event here. As part of the Sound the Alarm campaign, Red Cross has teamed up with many passionate elected officials. Last week, we met with the following partners: NYC Council Member Michaelle Solanges, NYS Senator Anna M. Kaplan, Manhattan Borough President Gale Brewer, and Westchester County Executive George Latimer. On Thursday morning, PIX11’s weekly segment PIX11 Honors highlighted the work of the Red Cross and our volunteers. Red Cross volunteer Jesennia Rodriguez, who “pays it forward” after suffering tragedy, was among those featured. Wednesday afternoon, a massive fire tore through an apartment building in Sunset Park, Brooklyn, leaving more than 50 families homeless. Red Cross teams have been working non-stop since, alongside NYC and other non-profit partners to support dozens of families. Patch Brooklyn highlighted Red Cross support in this article. On Tuesday, two vans full of supplies from our Metro New York North Chapter traveled to the Red Cross office at Walter Reed National Military Center outside of D.C. The supplies will comprise our Medevac bags for critically wounded soldiers when they arrive from overseas. April 9, 12, 15: Red Cross blood drives will take place from 2 to 7 p.m. at the Greater NY Red Cross building located at 520 West 49th Street, Manhattan. Schedule an appointment to donate today!